I had often looked wistfully at the facade of S & W Country Diner when Happy Meal and I were eating at the El Pollo Loco across the street. Happy Meal had never been game for trying the diner, and, as usual, the youngster proved to brighter than myself. Fat Bruce Lee and I had originally set out to try City Tavern, but they were in the middle of a film shoot there, and they didn't bother to update their website to warn off potential customers. 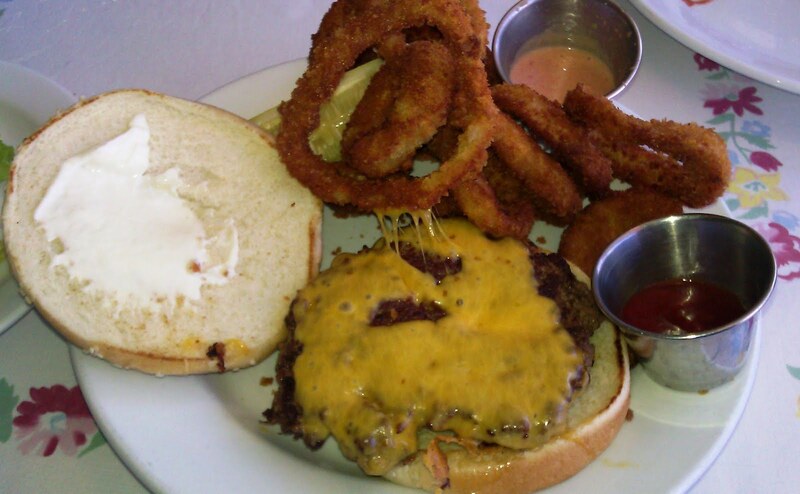 Our backup burger was at Le Saint Amour, but they had recently nixed the burger from the menu. We are not good at taking hints. So, undeterred, we walked around the corner to S & W Country Diner. They had a selection of burgers on the menu, and at this point, we were quite hungry. We had already paid for metered parking on the street. Our cheeseburgers were ready in about 10 minutes. Note: S & W Country Diner only takes cash. 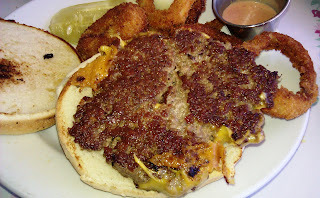 The Beef: At S & W Country Diner, the beef tasted and felt like a very low grade of fatty Chuck. The burger patty was a crumbly puck of flavorless, oily, connective tissue and amazingly flavorless beef. It had all of the appeal of a scab. The 1/3 pound burger was vaguely beefy, and that was the extend of the flavor. The beef was oily to a fault. We didn't really chew the beef, we simply mechanically separated the bits of connective tissue and choked them down. The Sear: The sear was remarkable. This was very much like the bland but epic sear, which we saw at the Steak 'n Shake in Las Vegas in July of this year. The sear provided crunch, but there was no flavor to bring out. It was all style and no substance. The Preparation: After one bite of the burger, I had zero interest in learning about how S & W Country Diner prepared their burgers. I deduced that the irregularly shaped patties must have been formed by hand. It was also apparent that the burgers were cooked on a very hot flat top. The burgers were only 1/3 pound, so at least they were mercifully small. The burgers were cooked to Well Done. The Cheese: S & W Country Diner used a very mild Cheddar on their cheeseburgers. The Cheddar was also nearly completely lacking in flavor. It was nicely melted, though. The Bun: The bun was a big, soft, seeded, sweet, hamburger roll. It was a on the dry side, and it was unevenly toasted. I would have rather eaten the bun that the burger patty. 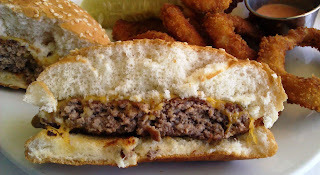 The Meat To Bun Ratio: The bun was too much for the small, bland, oily burger patty. 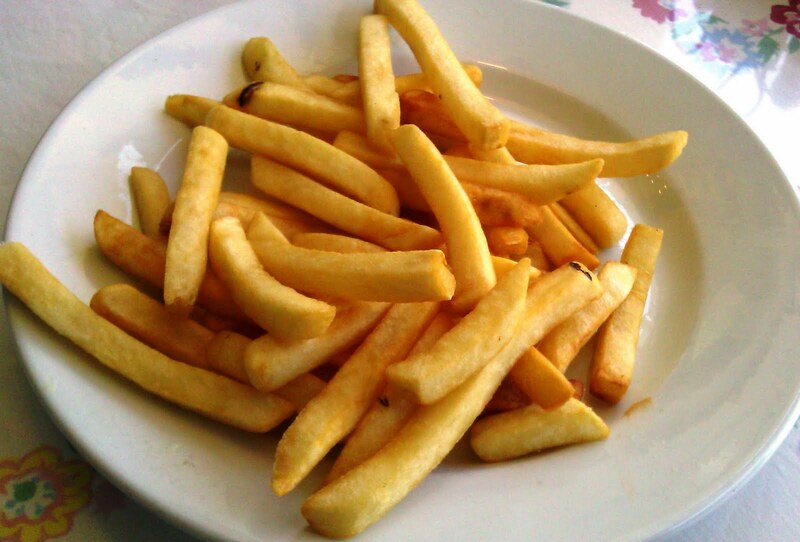 The Fries/Rings: Both arrived completely unseasoned. Neither were created in-house. The fries were competently cooked. The rings were breaded in corn meal and were then cooked hard enough to become satisfyingly dark and crunchy. The Toppings: The Romaine lettuce was fresh and crisp. The tomato slice was delicious and juicy. The tomato was the best thing on the plate. Accordingly, the tomato slice was the only thing on the plate that I was inclined to finish. The Value: The Cheeseburger Combo (1/3 pound burger, soft drink, and fries) was $7.95. Rings were an extra 75 cents. The value would have been fine, but the burgers were so sub-standard that any price would have been too high. The staff at S & W Country Diner was efficient and friendly, and the place, while well worn, was a nice, little diner. Sadly, the burgers were utterly bland and made with what appeared to be a very low grade of beef. I would not subject myself to a second cheeseburger at this establishment. To this date, we have yet to find a good cheeseburger in Culver City, CA. I dutifully brought back the uneaten half of my burger to The Burger Busters world headquarters, and none of the minions could get past the first bite. Burger Review : The burger at S & W Country Diner was a study in oily blandness. Pass.